In the early fifties, I regularly attended the Camden Stock Sales. These were held each Tuesday. This was a great opportunity to meet the local farmers and as I was selling tractors and motor vehicles many sales were secured on these days. After the sales, most gathered in the local hotel for an enjoyable hour. I met many interesting people on these days, including one of the most remarkable characters I ever met. Jim Rootes had lived in Luddenham all his life, and had always been closely associated with horses. In his early days, he used to round up wild horses in the foothills of the mountains and drive them to Wallacia. He said an Irishman paid him so much a head for them. He also was into racehorses, touring the country race meetings. He told me some great tales about those days. He started a butchery business in Luddenham operating from a cutting cart. He did his own killing and delivered the meat on a regular run in his cart. As there was no refrigeration, any meat left over after the run was boiled down. At the time I met Jim, he had retired but still had a few cattle and retained his interest in the property. My first meeting with Jim was deliberately planned by me. I had heard that he could be a prospect for a new utility truck. After a couple of sessions with him at the saleyards, I decided that this was not the best venue to attempt a sale and I would visit him at his home. I had already summed up the nature of the man and arrived at the following conclusions; he was tough; he pulled no punches; he spoke his mind on all things, regardless of whom he upset. If you couldn't take it, that was your problem. If you could you were his friend. At the time he was in his sixties, but he could still turn on the charm for the ladies. I had already decided on a trade-in price for his existing Ute. It was a 1937 International and was in a most neglected state. Some of the cab windows were missing and replaced by sheets of Masonite. I decided to call unannounced and duly arrived about midday. I knocked on the door and was called in. Jim was sitting on the front verandah and told me his wife was away in Sydney for the day. We talked for a while, but I couldn't bring the conversation around to the sale of the Ute. The verandah faced the old Luddenham road. On a block of ground on the other side was an old double-decker bus with washing hanging on a line outside. I asked Jim if someone lived there. He said there was a young married couple with five kids. I think it's five, let me see, there's two that's his and two that's hers and one that's theirs. But she keeps them clean. As I was getting nowhere, I suggested that we would be better talking over a beer at the Wallacia Pub and Jim agreed. At last I could get him in the new Ute. When we finally reached the pub, I realised that on the trip down Jim had absolutely ignored all attempts to interest him in the vehicle. We settled down to hours of solid drinking and anxious to get back to the Ute, I suggested we move on. Jim immediately turned on me. "So you can't drink any more" - I denied this and ordered two more schooners. Fortunately one round after that Jim decided he had all he could handle. We left the pub and drove back to Jim's house. Again he completely ignored the Ute. I began to think I was wasting my time. When we pulled up in his back yard, he surprised me with an announcement. "Before you can sell me a Ute Bare, you have to prove yourself". "I challenge you a standing jump, a running race or a wrestle". I was in no condition to jump or run, so I chose the wrestle. We set-to on the lawn. In spite of my age advantage, he was very strong. I also didn't want him to be the loser. Just when I was considering the outcome of the ridiculous turn of events, we were inundated with a torrent of water. Jim's wife had arrived home and, not knowing what was going on, threw a full bucket of water over us. When we picked ourselves up, she looked at me and said "I know you. You are Roy Bare". I was surprised because the last time we met, I was about eight years old. We certainly must have presented quite a picture, covered in dirt, shirts torn and very drunk. She ordered us into the house to clean ourselves up, while she made a cup of tea. I figured I had passed all tests by this time and when we settled down for the first time, I suggested we close the deal on the Ute. His reply was to throw his chequebook to me with instructions to "write the cheque out my bloody self". Victory at last! When I handed him back the book, he grabbed my arm and shook hands vigorously. He then said, "you know Bare, lots of fellers have tried to sell me a Ute with their little bags and their little mo', but I like the way you do business". Finally, I was able to get away and it was a great relief to find myself in the peaceful night air. I was no sooner out than the door opened and Jim called me back. He then asked a question that I will never forget. He said, "Tell me Bare, what sort of a Ute did I buy, not that I give a bugger, but my boys are sure to ask me?". How many salesmen can claim such a unique sale? After a good nights sleep, I woke up feeling pleased with the previous days work. This feeling was short lived. I decided to check over the figures of the deal and discovered I had undercharged him by One Hundred Pounds! This meant I would have to go back and recover the money. He would be sober and in a different frame of mind and I fully expected him to call off the deal. When I arrived he was working in his shed and I told him that due to an error he owed me One Hundred Pounds. His reply was to throw me his chequebook and he simply said "there are plenty more cheques in the bloody book aren't there?". I realised that out of all our ups and downs, we had developed a great respect for each other and a friendship that lasted many years. I had earned his respect by never backing down to his many unorthodox approaches to all he met. This was his way of sorting people out. I recently attended Jim's funeral at the Luddenham Church. He had lived in Luddenham for just over one hundred years. 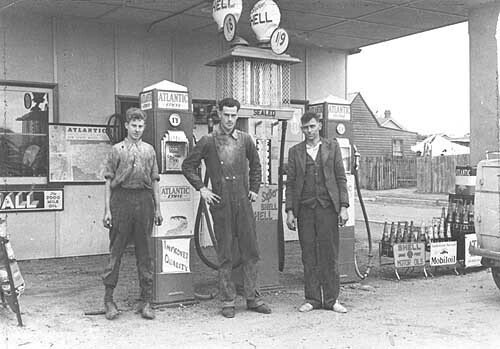 The photograph below, taken in 1937, shows Roy (centre) in his first start in the Motor Trade under the Government Trainee Scheme. The Motor Cycle Service company was Watson & Kilfoyle - Macquarie St. Liverpool NSW. On the right is Percy Watson (Proprietor) and on the left is Oscar Easterbrook. 1 shilling & 9 pence per gallon (approx 4c / litre).